I have always been fascinated by dinosaurs. For the longest time I even considered becoming a paleontologist when I grew up. But then the reality set it that paleontologists spend hours and hours outside in the hot desert sun digging giant holes with tiny shovels, and that was the end of that nonsense. I never stopped loving dinosaurs though. Growing up I know I had my share of plastic dinosaur toys, and I remember watching the Land Before Time movie more than was probably healthy. Little Foot and the gang were great, but the summer of 1993 changed everything for me with the release of Jurassic Park. At this point I think everyone already knows how great of a movie Jurassic Park was, especially considering it was the highest grossing film worldwide at the time of its original release. Jurassic Park blew people’s minds with how realistic the dinosaurs looked. In fact it’s still one of my favorite movies partly because of how real the dinosaurs look, as well as how well the other actors interact with those dinosaurs. As with any great movie, it eventually gets sequels, and spin offs, and of course videogame tie-ins. 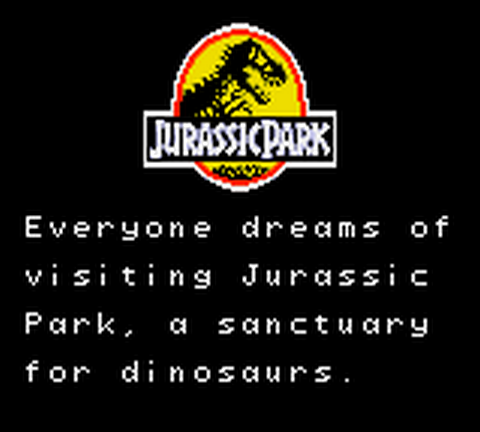 Today we’re going to look at the Game Gear version of Jurassic Park. I remember loving this game as a kid, and if I remember right, it was one of the first games I ever beat on my own without any cheats. So join me on Isla Nublar to see if I can survive the escaped dinosaurs, or if I’ll become one of their dinners. Welcome to Jurassic Park, the island theme park where scientists have brought real live dinosaurs back from extinction. And a theme park which may never open to the public now that computer problems have allowed the dinosaurs to escape their enclosures, threaten the safety of everyone on the island. With no one else to turn to, they fly in Dr Allen Grant to contain the situation. I think the staff might have taken the title of “Dinosaur Hunter” a little too literally when they hired this paleontologist to round up their escaped dinosaurs, but we’ll do our best anyway. The staff has identified four areas of damaged fence where the dinosaurs are escaping from. There’s the Velociraptors to the north, Pteranodons to the east, Brachiosaurs to the south, and the Triceratops to the west. Since they’re probably the most dangerous, and I wouldn’t want them roaming around very long, I chose to try to contain the Velociraptors first. However, just getting to that side of the park in one piece is going to be its own challenge. Each area starts with a mini-game showing your drive to each of the sites. Apparently the sound of the jeep lures out every dinosaur in the area, and you’ll have to defend yourself if you ever want to make it out alive. You control the crosshairs on screen and it’s up to you to shoot all the dinosaurs that try to attack the jeep before they cause enough damage to break it. Thankfully, every dinosaur you kill will also drop an item of health to heal you. These sections could easily be brushed off as just simple mini-games to pad the length of the game, but in reality they do have a significant impact on the rest of the stage. While most of the dinosaurs attacking the jeep only drop health, there are a few that drop more useful items such as extra lives. Even more important however are the ones that drop gas cans, which when collected will actually add extra bars to your health for the duration of the stage. Failing to collect these can make the rest of the stage a lot more difficult. Rounding off the mini-game is a boss encounter with a larger dinosaur, a Pteranodon in this case. These larger dinosaurs are much harder to kill than the others, and actually have their own health bars in the upper right corner. You’ll have to shoot them quite rapidly to prevent it from ramming into the jeep. To make matters worse, the occasionally rock in the road will launch the car into the air, throwing off your aim with the crosshairs as well. Win or lose, you’ll still advance to the action stage of the level. But before we get into that, let’s take a look at what equipment we have available. Bringing up the pause menu will allow you to switch between any of the three weapons available. There is a Tranquilizer Rifle which serves as your general purpose gun, sending a wave of energy in front of you to knock out the dinosaurs. You also have Concussion Grenades which you shoot up into the air and are most useful against Pteranodons as well as any dinosaurs that might be on ledges above you. The final weapon is the Fireball Grenade, a weapon a rarely used. The Fireball Grenade is the most powerful, but it is thrown in an arc and I just found it hard to use compared to the Tranquilizer Rifle. Also in the pause menu are first aid kits. These are scattered around the levels, usually in hard to reach places, and allow you to restore your health at any time. Onto the stage itself, the computer problems seem to have extended far beyond just the fences as they’ve managed to destabilize the very ground you walk on, seeing as it crumbles away as you walk across it. Not only that, but it has cause lava to shoot up into the air in a perfectly synchronized water fountain like fashion. Having destroyed the bridge in the process, you’ll have to grab hold of the upper supports and swing your way across. And that’s all just to make it to the front door of the building. Inside you’ll be greeted by a flock of Pteranodons that have somehow managed to get inside. They seem to be quite content inside this warehouse, even though I would think the metal framework would make it hard for them to fly around. Whatever their state of mind, they still see me as potential dinner and will go into a dive bomb as soon as they see me. Of course, this is the Velociraptors area, and as would be expected, there are a few of them just around the corner waiting to pounce. A few good shots with the Tranquilizer Rifle and it will be lights out for them. However, even the Velociraptors seem to be the least of my problems here in the power station. There are several areas of exposed wires shooting off electricity at anyone foolish enough to walk by them. There’s also an elevator ride with constant threat of electrocution as the electricity shoots straight out from the walls, forcing you to press yourself against the opposite wall. I can only hope and pray that these dangers are a result of the computer problems, or even the dinosaurs themselves damaging the equipment. I’d hate to imagine the power station was actually intentionally designed this way. Avoid being fatally electrocuted and you’ll come face to face with the first boss, the alpha Velociraptor. Considering the Velociraptors are perhaps the most dangerous of the four escaped dinosaurs, it’s kind of amazing that the boss battle is the easiest one. I never even had to move from my starting position. There are four doors in the room and the Velociraptor will appear in one of them, and then run straight across to the other open door in the room. It really pays no attention to you as it runs around, and after shooting it once, it won’t hurt you for the rest of that run, even if it touches you. So just stand still and shoot it as it shows up, you really don’t need any more strategy than that. It’s still a boss battle though, and it will take a few rounds before you finally put him down. Of course, you aren’t here to KILL the dinosaurs, they’re the star attractions of the park. To bring that point home, the post battle scene shows the Velociraptor alive and well inside a cage, and ready to be transported back to his enclosure. Let’s just hope those bars can hold him better than the electric fences did. With the Velociraptors now once again contained, I already feel like the island is a safer place. And so, we’ll just travel clockwise around the island to capture the rest of them. That means our next stop has us trying to contain the Pteranodons. It also means another mini-game. The bulk of the journey is the same, except we’re shooting small Pteranodons instead of the little dinosaurs from before. Also the boss battle is slightly different. We’re still fighting a Pteranodon, but this time it’s carrying a large bolder which it tries to throw at the jeep. You’ll have to shoot the boulder out of its claws or risk it being dropped on your jeep. Upon arrival at the site, we find ourselves at the bottom of a cliff side. We also learn that Grant can’t swim, not even the slightest as the water below acts as a bottomless pit. I guess it makes sense, spending hours out in the desert digging in the sand doesn’t exactly prepare you for swimming. You’d think any full grown adult would at least be able to tread water though, and not just sink like a rock. Speaking of rocks, the cliff side seems to be experiencing some kind of rock slide, as giant boulders are regularly falling down from above. I’m sad to say that while the boulders never hit me, they did distract me long enough to make me slip off the cliff and fall into the water again. I’d better get inside the work tunnels before I fall into the water a third time. Unfortunately, these tunnels don’t seem to be much safer. They’re an odd maze of random elevators and moving platforms over pits of sharp rocks. Not only that, but there aren’t even paths to many of the platforms, which leaves climbing along the ceiling Grant’s only option. I guess a paleontologist really was the best choice for this job. All those hours digging have strengthened his hands and fingers into the tools of the gods, allowing him to find support in what looks like a smoothed flat rock face. Having navigated the tunnels and scaled the cliff side, we’re now open and exposed to the Pteranodons swooping down from above. The Concussion Grenades make quick work of them, scaring them off into the sky. However, the dinosaurs once again prove to be the least of my problems. Just like back in the Velociraptors area, the ground here in unstable and crumbles as you walk across it. This caught me off guard, making me miss one of the jumps, and once again go plunging into the water. Someone buy Dr Grant over here a life jacket to wear! We need to focus or we’ll never capture all these dinosaurs! Those small Pteranodons were just target practice apparently, as now we come face to face with the boss of the stage. Just like in the Velociraptor fight, the Pteranodon pays little attention to you and instead flies in a predictable pattern between the trees. The stage itself is actually rather interesting. From the screenshots, you can already tell that we’re high up in the trees, jumping from branch to branch as we try to avoid the Pteranodon as well as line up some shots to subdue him. What you can’t tell from the stills is that the screen is constantly scrolling upwards, adding another element of danger to the stage. After enough hits, the Pteranodon can take no more and is returned to its enclosure. With all the trees around, I guess they couldn’t get a truck out here to drive it back, so they bring in one of the helicopters to air lift it out. A rather risky move if you ask me. It’s barely contained in any way and its wings are just kind of flopping down. If it wakes up and starts moving around it’s going to pull that helicopter right out of the sky. But I guess I shouldn’t worry about that right now, there are still two more dinosaurs to capture. We now head south to the Brachiosaur area. With how big a Brachiosaur is, I’m not sure what they expect me to do to capture it, but we’ll have to try something. Of course the drive to a new area means another mini-game. The little dinosaurs are back this time and provide some nice target practice. The boss however is much different. This time instead of a Pteranodon it looks like it’s a T-Rex hot on our tail! QUICK, SHOOT IT IN THE FACE BEFORE IT EATS US! We escape the T-Rex only to find ourselves on a water front. Focus Grant, we already know you can’t swim. There are a couple different kinds of dinosaurs in this area. There are a bunch of Pteranodons pecking at the bones of some creature. But they fly off as soon as I get close to them. The threatening dinosaurs are the ones that jump up out of the water, taunting Dr Grant with their ability to swim. I’m not sure what kind of dinosaur they are, but a quick shot from the Tranquilizer Rifle sends them right back into the water where they came from. As we make our way inside, we’ll have to look out for more Velociraptors. I thought I took care of those guys back in the first stage. I guess more of them escaped than I had thought. Maybe being inside with them isn’t the best idea. We’d better head out the back way and hope they don’t follow. Of course, the escaped Brachiosaurs are waiting just outside the door. They’re huge, but at least they don’t seem to mean any harm, they’re just kind of curious to see what I am. But curiosity from such a giant creature can quickly turn dangerous. With nowhere else to turn, I guess this inflatable raft on the river will have to bring us to safety. I don’t think I could have made a worse decision in my life if I tried. Brachiosaurs apparently love the water, and their long necks allow them to easily come up for air. As innocent an action as that might be, with me out here on a little inflatable raft and possessing no ability to swim whatsoever, this is a terrible situation for me to be in. We’ll have to knock the poor thing out before it can knock me into the water. We were sent here to capture it anyway. After a few hits from the concussion grenades, the Brachiosaur finally collapses on the river bank. Unfortunately, the Jurassic Park staff doesn’t seem to have any better idea than I do on how to get the massive thing out of the water. They brought a crane, but even that doesn’t seem big enough for the job. They’re the professional though, and I’ll just have to trust they know what they’re doing. With three of the dinosaurs already safely recaptured, that means there’s only one left, the Triceratops. Again, there is a mini-game as we drive out to the west side of the island, and again we use those dinosaurs as target practice. Once again, the boss dinosaur changes, this time to a bipedal dinosaur with a boney plate on its head, possibly a Pachycephalosaurus. Whatever it is, we’re going to have to shoot it in the head a few times to stop it from ramming our jeep. Here in the Triceratops sections, Mother Nature seems to be pissed and want nothing more than to kill us. Whether it be small localized tornados, or constant lightning strikes punching holes in the ground, I can only stop to wonder what I did to piss off Mother Nature so badly. The lightning strikes become so bad that they even start the ground on fire. We’ll have to jump up into the trees or we’ll be burned to death. That’s not really the best strategy however, since the fire will only spread into the upper branches. When I found a small pond, I thought I might finally be safe, but I was so wrong. Mother Nature took that moment to strike the pond with lightning as well, sending ripples of electricity through the water. We’ll have to hold onto the branches or risk electrocution in the water. When we finally do find the escape Triceratops, it seems a welcome change to the forces of nature that preceded it. There is however very little room to manure in this clearing. With the triceratops gearing up to charge, our only hope is to jump up into the trees out of its attack range. Now stuck with its horns in the tree, we can get in a few shots with the Tranquilizer Rifle before it can recover. It’s a cleaver beast however as it kicks up dirt with its back legs while trying to free itself. Not only that, but it has learned our tactic, and will now kick up dirt to attack us in the trees. It’s the toughest battle so far, but eventually we manage to knock it out and can bring it back to its enclosure. However, I can’t help but question the competency of the staff at this point. They did ok with the Velociraptors when they put it in a big cage. But then the Pteranodon wasn’t restrained at all, and they couldn’t figure out what to do with the Brachiosaur. But I have to draw the line here. Who thought it was necessary or even helpful in the slightest to put traffic cones down around the Triceratops? Are we scared some random car is going to come out here into the woods and somehow not see the 10 foot long creature laying on the ground? Even Dr Grant looks like he’s pointing and yelling at people to do something helpful. What are you two doing just leaning up against that tree? Go get another cage or something before it wakes up! I was brought in to capture the four escaped dinosaurs and I did just that. Whatever the staff ends up doing with these dinosaurs is none of my concern. However, the ride back into base reveals one last challenge. Perhaps the one people should have been most concerned with the whole time. The Tyrannosaurus Rex has also escaped his enclosure and is heading straight for the Visitors Center. This stage is actually a secret bonus level in the game. As a kid, I could never figure out how to unlock it, and I thought it was random, but I now know that it’s unlocked by completing the other four stages all without using a single continue. With how easy the rest of the game is, this feat is quite easy to accomplish. However, I always dreaded unlocking this stage because it is so much harder than the rest of the game. You’re also given little chance to learn the layout of the level because of the fact that you lose all of your continues at the start of the stage. As a kid I never managed to beat it. Let’s see if my skills have improved over the years. One final time we embark on the mini-game. This time we really need every bar of health we can get. When the boss shows up he’s terrifying compared to previous bosses. He’s bigger, and a blood red color and he is much more aggressive than any of the others. He’ll be right up on the jeep before you know it, and he isn’t likely to be knocked back like the others were. You’ll just have to keep shooting as fast as you can and hope it’s enough. Upon arriving at the Visitors Center, you’re greeted with an equally terrifying sight as the staff and scientists are seen running in terror for their lives. What have we gotten ourselves into now? I always thought it was the dinosaurs they should be running from, but in reality, the computer problems may have just triggered the automatic laser defense turrets mounted seemingly everywhere in the Visitors Center. I want to let that sentence go, but I just can’t. Why on earth are there such an excessive number of automated laser turrets set up in the VISITORS CENTER?! What kind of paranoid psychotic architect did you guys hire that they were insistent the visitor’s center needed an extensive laser defense grid? It doesn’t even keep the dinosaurs out! They’re too smart for that. The Velociraptors have figured out how to use the automatic garage door openers to hide in the various conveniently placed storage areas. The juvenile T-Rexes on the other hand have taken up hiding inside the walls like the worst kind of infestation imaginable. The only time you see them is when they stick their heads out one of the holes they managed to break in the walls just to eat people that walk by. When I finally made it to the Tyrannosaurus, I had no idea what to do to knock it out. None of the weapons seem to have any effect on it. There are also no safe areas in the room. It’s just you and the T-Rex locked in a tiny room together. When he pins you in the corner, there’s really nothing you can do but curl up in ball and accept death. That death will of course come quickly because every attack from the T-Rex takes away 2 bars of health. After a few deaths and much struggling, I finally figured out at the very least a way to hurt the behemoth. By using the Concussion Grenades, I managed to knock some of the boxes off the shelves above which came crashing down on top of him. They didn’t do a whole ton of damage though, and there still aren’t any safe places to hide when he attacks. It wasn’t until I remembered those med kits I’ve been picking up throughout the whole game. I haven’t needed them even once so far, so I completely forgot that I even had them. I’m sure there must be a more effective strategy for fighting this boss, but I just can’t see it. While it might not have been a very good strategy, the results speak for themselves as the T-Rex comes crashing down to the ground. I included the Staff Credits because i have my doubts any of those are real names. Now that the T-Rex is contained, all the dinosaurs are accounted for and reconstruction can begin. Dr Grant is treated as a hero, and several months later the park finally opens to the public. From the handful of images shown, very few safety precautions are put in place, and no doubt those dinosaurs will escape again to terrorize the island. But I will be long gone by then, and it won’t be my problem. Good luck everyone stupid enough to visit Killer Dinosaur Island! I’ll admit that the gameplay is rather generic, but I’ve said it before that generic doesn’t automatically mean bad. The game doesn’t bring anything new to the table but it handles everything very well in my opinion. Starting with the minigames leading into the stages, I do believe those are the best console crosshairs I’ve ever encountered. The speed and responsiveness of the movement is absolutely perfect, or as close to it as you can get with a D-Pad. Then on the stage proper, the controls are well handled, the environments feel alive, and the level designs are fun and varied. The ratio of environmental hazards to actual enemies might be leaning heavily towards hazards, but that never detracts from the game. Then the boss battles at the end of each of the stages are all fun and rather unique, though admittedly a bit too easy. All together it forms a very fun experience, which is exactly what you’re going for. Considering the limited space to work with on the game gear screen, the graphical quality is actually really good. Dr Grant himself ends up somewhat generic. Actually, for the longest time I didn’t even acknowledge that it was supposed to be Dr Grant. For some reason the player character always gave off a feminine vibe to me and I thought maybe you were playing as Dr Sattler instead. Though neither of them are actually a good fit for the gun toting hunter you play as. The Dinosaurs however look amazing, and really the dinosaurs are the stars of the game anyway. They have impressively large sprites which are very detailed for the time, and many of them look truly menacing. I’ve always enjoyed the music in this game, but again, it’s a bit generic. All the music fits well and adds a nice atmosphere, but none of it is particularly memorable. I do have to give them credit for really nailing the T-Rex roar and using as the starting cue for each of the stages. But then at the same time I feel I need to be really critical of the fact that the iconic theme song doesn’t appear anywhere in the game, unless I just missed it somehow. The story in the game takes a huge departure from the movie. Instead of being on the island when the systems fail and trying to survive, you are actually flown in after the fact with the goal of containing the situation. It’s an acceptable change which lends itself nicely for the type of game they were trying to create. While playing, everything is held together nicely and with more thought than most other action games. The beginning of the stage minigames show the hazardous drive to the different parts of the island, followed by the stage proper, and finally the capture of the escape dinosaur. It’s the post boss battle screens that really seal the deal for me, showing off that the dinosaurs are still alive and well. I just love the fact that the dinosaurs aren’t being hunted like monsters. Instead you’re trying to contain escaped zoo animals, for lack of a better term. The game is kind of on the short side. But to its credit, the Game Gear ate batteries faster than you could buy them, so it had to be a short game if you ever wanted to finish it. Despite the short playtime, they manage to pack a lot into the game to keep it exciting. Then the secret Tyrannosaurus stage added a lot of replay value to the game. Like I said earlier, I never managed to beat it as a kid, and without the extra lives I gave myself, I not sure I would have beaten it this time either. The bulk of the game is very easy. I had 3 deaths in the Pteranodon area all from bad jumps and falling down the bottomless pits. But those 3 deaths were my only deaths until the final secret T-Rex Section. Even there, I died once from those stupid lasers, and not again until I fought the T-Rex himself. Then of course it took 5 deaths and 3 med kits before I killed him. So really, the T-Rex was the only actual challenge of the whole game. I might be a bit biased towards this game since the Jurassic park movie is one of my favorites, but I love this game. Everything about it is just so much fun. The gameplay is great, as are the graphics. While the game is admittedly very easy, it’s not so easy to be boring. You still need to be on your toes or you’ll easily get blindsided. It does have a few flaws. The playtime is short, and the game is very linear, which might turn off the explorer types. Then considering this game is a Jurassic Park title and should be all about the dinosaurs, it’s a bit surprising how few you actually encounter. Even so, the seeming lack of dinosaurs never hurts the game any. 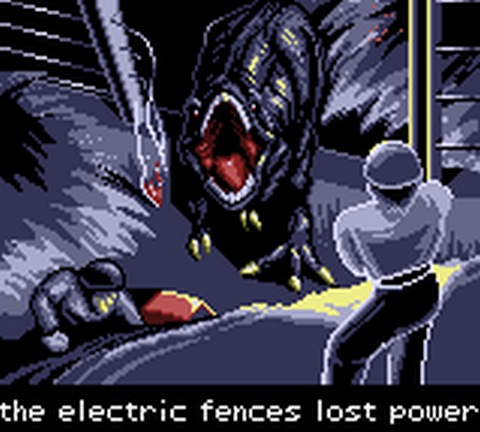 At the end of the day Jurassic Park ends up being an entertaining adventure game and definitely one that would appeal to fans of the franchise. If you still know where your game gear is, consider adding Jurassic Park to your collection. You won’t be disappointed. I hope you enjoyed Jurassic Park. If you did, like and follow me on Facebook or Twitter. Also leave your comments, suggestions, and recommendations. If you’re feeling real generous, you can even Donate to help me keep the site going. Thank you for reading, and I’ll see you next time.